MONTCLAIR – Tents and umbrellas dotted N. Fullerton Street and the lawn of First UMC in downtown Montclair. Gray clouds and drizzles couldn’t keep the crowds from music blaring under a covered outdoor stage, sweet smelling treats, and the bustle of colorful activity. On Saturday, May 6, the church and various community partners hosted the second annual N. Fullerton Arts & Crafts Fair where artisans, crafters, kids groups, organizations, food vendors, and musicians set up shop for a day of community bonding. 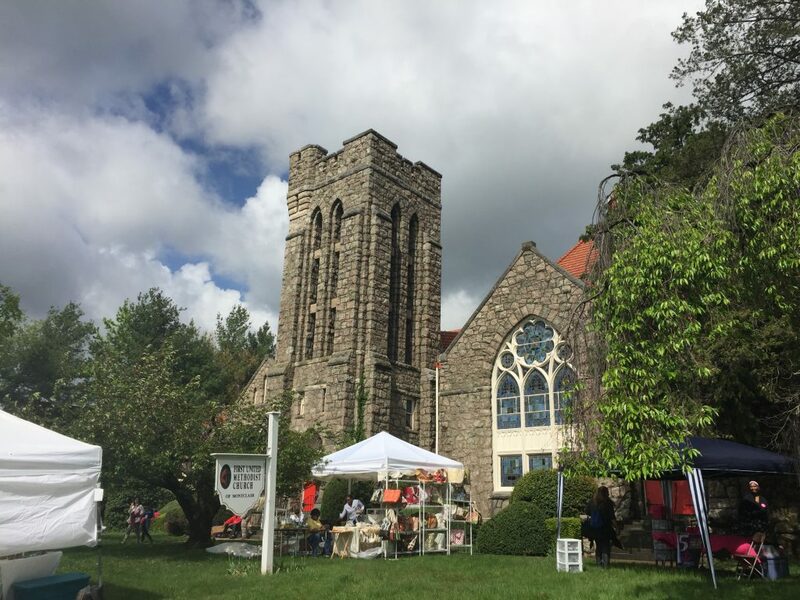 “We had a great success last year, but no doubt, this year’s event brought the community a much greater joy as we had more than 30 vendors including the YMCA of Montclair, a local animal shelter, Whole Foods of Montclair, several food vendors, jewelry makers and live musicians,” said Rev. Earl Kim, Senior Pastor of First UMC. This year, the festival co-hosted the event with the Montclair Center Business Improvement District and had Chase Bank as a sponsor. The town, widely known as artistic and culturally diverse with its own art museums, film festival, galleries and unique restaurants, was a natural fit for the church’s arts festival outreach to an already creative community. “The congregation here believes this event is a creative and effective way to open the church to the community,” said Kim. The free, outdoor event pressed on despite inclement weather, drawing families, children, and passersby’s. From face painting to kid-friendly art activities, food tasting, and free health screenings, the amount of vendors and musicians nearly doubled from last year. “We prayed the rain away,” said Nicole Peaks, a church member of nearly 16 years who organized the music with new and repeat acts. By the end of the festival, Peaks had a stack of business cards from musicians wanting to be a part of next year’s event. Former President of the UMW and now the organization’s Treasurer, Peaks is active in the Montclair church’s music scene and hopes to continue growing the festival. For Peaks, building a social media presence for an event like the N. Fullerton Arts & Crafts Fair is key. She encourages other churches to step out in faith, use their talents and make connections in their communities. Next year, the church anticipates a larger crowd, more vendors, musicians, and better weather.